You know that feeling of satisfaction after you organize your office or finally sort through a pile of laundry the floor? Turns out you can conjure the same feel-good sensation when you tidy up your WordPress calendar using event categories and tags! But that sense of satisfaction isn’t just for your own benefit. Your website visitors will also have a better experience using a calendar that’s well-organized and easy to search. By cleaning up your calendar taxonomy, attendees will be able to find the events they’re looking for as quickly as possible. In the world of WordPress, taxonomy refers to the way we group posts, typically using categories and tags. Categories tend to be broad and tags tend to be specific to a particular post or event. A single post may only have one category, but it could have several tags. WordPress also allows site owners to create custom taxonomies to group posts. 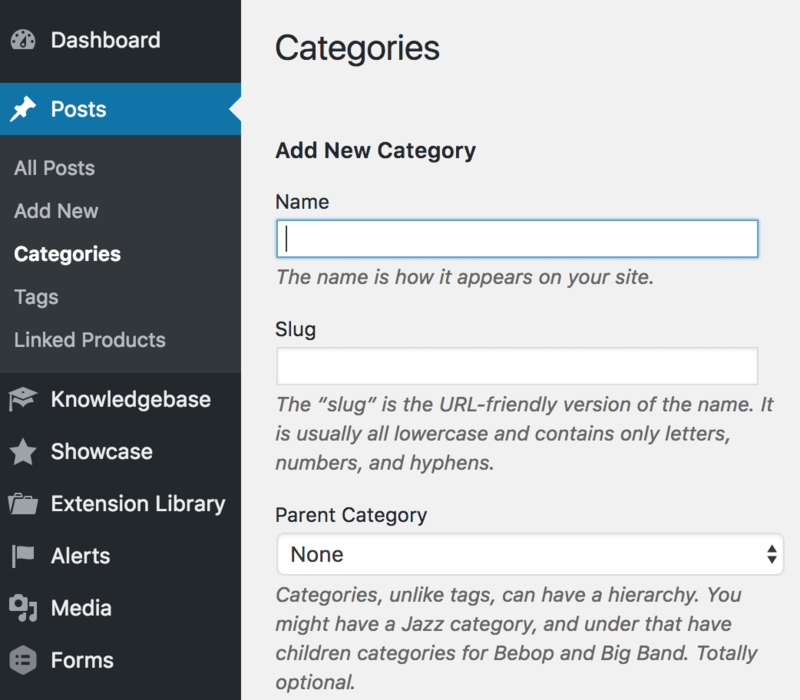 To get started using tags and categories in WordPress, you don’t need any special plugins—they’re already built into your admin panel. 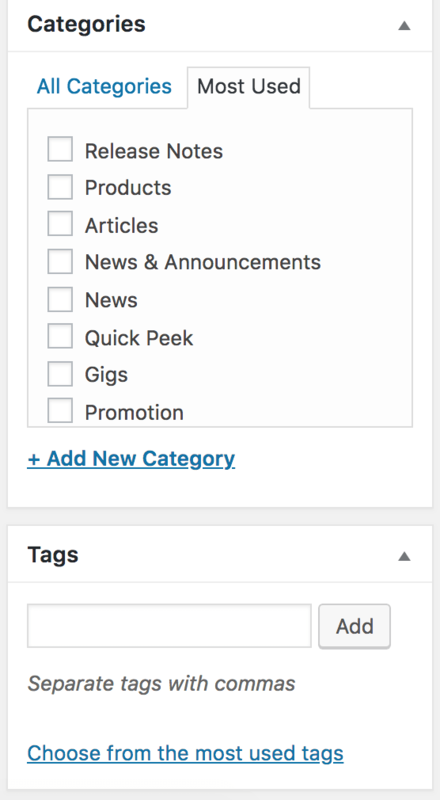 From the WordPress dashboard, navigate to Posts > Categories or Posts > Tags to create new categories and tags for your content. Within the post (or event) editing screen, you can choose from existing categories and tags or add new ones as needed from the right side of the page. When you’re creating categories, opt for broad topics that you’ll use regularly. Tags, on the other hand, can be specific to a certain post. 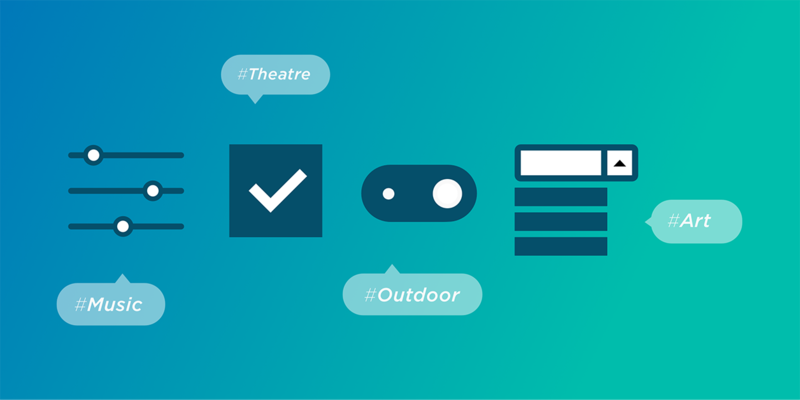 If you don’t want to create tags in advance, you can type them in as you create new events and contents. 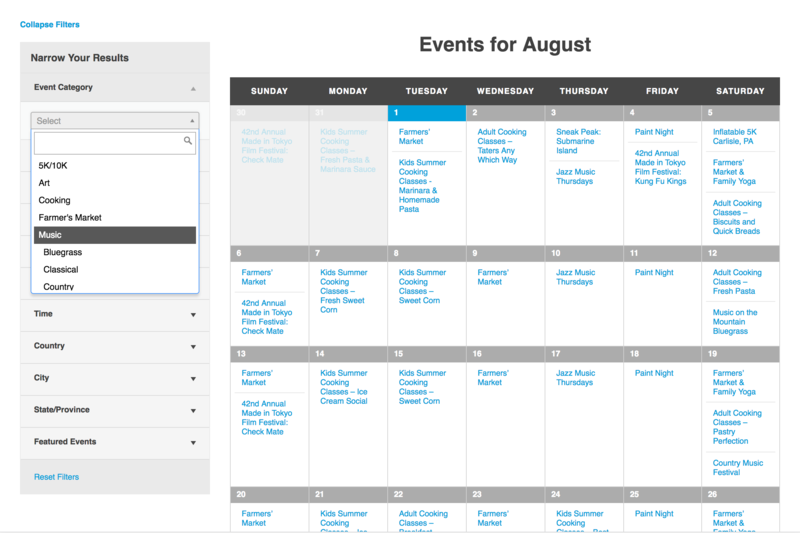 If you use The Events Calendar or Events Calendar PRO, you can also create custom event categories that can be easily integrated into your site’s navigation menu. If you’ve got a calendar filled to the brim with events, it’s helpful to add more advanced filtering such as the features offered in our Filter Bar plugin. This plugin works with The Events Calendar and Events Calendar PRO by adding a configurable set of filters to your calendar pages. Aside from filtering by category, users can also filter by venue, organizer, price, distance, and time of day. Bonus: When you apply filters, it appends the URL, which means you can share or bookmark a link to a pre-filtered calendar. The Event List Widget is another handy tool to showcase upcoming events. You can add it to any widget area on your site. The GIF below shows some of the configuration options available in Events Calendar PRO. Another feature of Events Calendar PRO is the [tribe_events] shortcode, which allows you to embed your calendar in places other than your main calendar page. You can add attributes to display events by category, so if you’re a music venue, for example, you can display a calendar that only shows jazz concerts on your jazz page and only show country shows on your country music page. You can also use shortcodes to display a calendar filtered by featured events, date, and more. Now that you’ve learned a fun new word (try saying “taxonomy” five times fast), spend some time shoring up your event categories and tags. We promise the effort will pay off for your end users who want to find their favorite events as quickly as possible. TL;DR: Create new categories. Whip up some tags. Play with plugins. And if you’re looking for more solutions to organize and optimize your events calendar, check out the rest of our line of WordPress event management tools.